Research In Motion Ltd., the maker of the BlackBerry e-mail device, Friday announced it has settled its long-running patent dispute with a small Virginia-based firm, averting a possible court-ordered shutdown of the BlackBerry system. 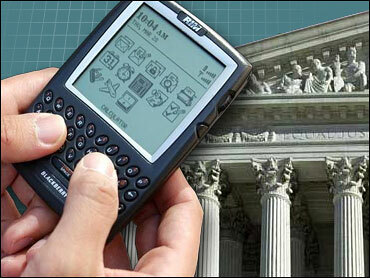 RIM has paid NTP $612.5 million in a "full and final settlement of all claims," the companies said. The settlement ends a period of anxiety for BlackBerry users. At a hearing last week, NTP had asked a federal court in Richmond, Va., for an injunction blocking the continued use of key technologies underpinning BlackBerry's wireless e-mail service. "This settlement was widely expected," says CBS News technology analyst Larry Magid. "There is a lot of money on the table, not just for RIM, but for many cellular companies that resell the hardware and service. Now RIM can start to worry about fighting off competition from Microsoft and others who want a piece of this growing market." At the hearing, Judge James R. Spencer expressed impatience with RIM and urged a settlement. "He basically questioned the sanity of RIM, and said it wasn't acting very rationally," said Rod Thompson, patent attorney at Farella, Braun and Martel in San Francisco. "His prodding of the parties worked." The settlement is on the low end of expectations, Thompson said, especially since RIM will not have to pay any future royalties. There had also been talk of NTP receiving a stake in RIM. RIM, which is based in Waterloo, Ontario, had put away $450 million in escrow for a settlement. It will record the additional $162.5 million in its fourth-quarter results, it said. Last month, a judge ended a hearing over a request for an injunction against the maker of the BlackBerry devices without issuing a decision. During that hearing, NTP Inc., a small patent holding firm that successfully sued Research In Motion, asked U.S. District Judge James R. Spencer to impose an injunction on the service but permit a 30-day grace period so all sides could work out the details of how to exempt government and emergency workers, among other issues. The Arlington, Va.-based company also recommended that the judge immediately halt sales of new BlackBerry devices and award it $126 million in damages, for starters. RIM has deposited $250 million or more in escrow, and NTP says that pot of money should be reserved just in case newer BlackBerry devices infringe on its patents. "This is a self-inflicted situation," said NTP attorney James H. Wallace Jr., who compared RIM to a squatter who continued to live rent-free. "It's just time to pay up." At that time, CBS News legal analyst Andrew Cohen predicted: "we'll still see some sort of a deal – there is just too much money involved. And I think both sides here are playing with fire a bit if they do not settle." Henry C. Bunsow, an attorney for Waterloo, Ontario-based RIM, argued against the injunction, saying it would not be in the public's best interests. The process of exempting government and emergency employees from the BlackBerry ban would prove difficult and problematic, he said. "It will take a lot of time," Bunsow said. "It will take a lot of effort." Bunsow also pointed to a number of critical users who would not be exempted. including hospitals, large government contractors, energy companies and financial institutions. Over the years, he said, BlackBerry use has become so prevalent that the device has become part of the country's infrastructure. CBS News' Alexis Christoforous reports that more than three million people in the United States use BlackBerries. At the end of the hearing Spencer said he would rule as soon as possible but provided no timetable. He also said that, if he ordered an injunction, he would make sure that the government's needs were met. A growing number of handheld makers including Palm, Motorola Corp., Hewlett-Packard Co. and Samsung Electronics Co. are making keyboard-equipped handhelds that run on the Windows Mobile operating system. These devices can deliver BlackBerry-like service using Microsoft's software or third-party applications from the likes of Good and Visto. BlackBerry users also can switch to their cellular provider's brand of service (many of these are powered by Seven and Visto).